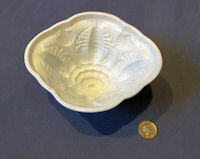 Original, quality 1920's white ceramic jelly mould with a plain outer with an oval foot to stand on and a very fine detailed mould to the interior of four crayfish with shells between. This is detailed in green "Shelley" for the manufacturer and "Made in England". Perfect and a difficult mould to find. 3.5" tall and 5.75" x 5". Original, quality late 19th century circular all copper jelly mould stamped '285' for the model number and impressed with the orb and cross logo for the manufacturer 'Benham and Froud' of London and Birmingham. This three tier mould is of a good weight, in super condition with no dents and a very good usable tinned interior. Polished and lacquered, although the lacquer may be removed at no extra cost and complete and in good and working order. 5" tall and 5.5" diam. 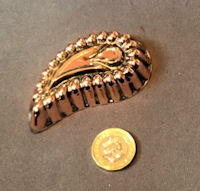 Original, quality late 19th century smaller than average copper jelly mould of an unusual design. This example has a shell shape to the top, a plain reverse and a vertical ribbed front. The reverse is stamped "55" for the model, and the interior tinning is in good order. Some very minor dents, otherwise complete and in good and working order. 3" tall x 5" x 3.25" front to back. 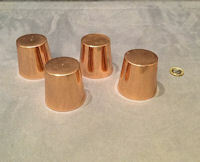 Original, quality set of four late 19th century small copper dariole moulds for small sponge puddings. Each one is impressed '6' to the top surface and all have good tinned interiors. Polished and lacquered, although the lacquer may be removed at no extra cost and complete and in good and working order. 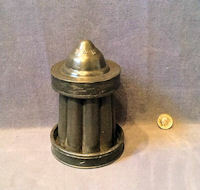 2.25" tall and 2.50" widest. Price is for the set. 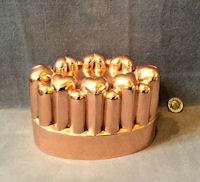 Original, quality 19th century copper jelly mould probably manufactured by Benham & Froud, although not marked as such but is impressed to the side "Registered April 29th 1863" and referenced to The Alexandra Star after Queen Alexandra Queen to King Edward VII. This example is in superb condition inside and out, although it would need re-tinning on the inside if wanted for use. Polished and lacquered, although the lacquer may be removed at no extra cost. Complete and in good and working order. 6.5" tall x 5.5" widest. 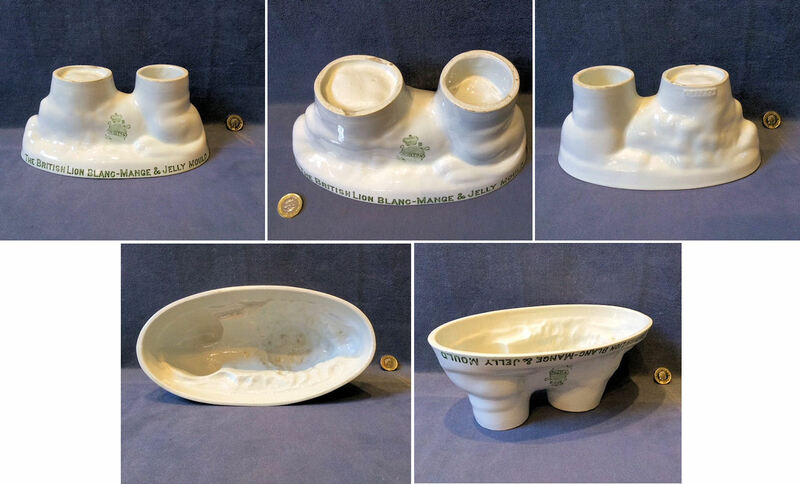 Original, quality circa 1900 / 1920's white ceramic jelly mould in the form of a lion laying down. 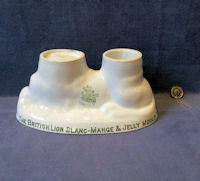 This example is transfer printed to the outside rim in green upper cased text "The British Lion Blanc-Mange & Jelly Mould" and for the maker "Winton GB" with the globe beneath a crown mark. Two minor chips to the feet on the base and some waste ceramic particals stuck in the glaze to the inside base otherwise complete and in good and working order. 9.5" x 4.75" and 4.25" tall. Original, quality late 19th century oval shaped copper sponge mould with good tinning to the interior and a super dovetailed seam to one side. Polished and lacquered, although the lacquer may be removed at no extra cost and complete and in good and working order. 6.5" x 4" x 3.25" deep. Original, quality late 19th century oval shaped copper jelly mould stamped '103' to one end for the model number. This super example has vertical "asparagus" shaped stems as the body. With minor dents only. Polished and lacquered, although the lacquer may be removed at no extra cost and complete and in good and working order but would require re-tinning to the interior if required for use. 4.25" tall and 6.75" x 4.25". 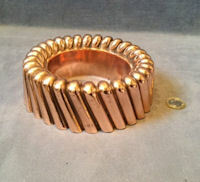 Original, quality late 19th century oval shaped copper jelly mould stamped '135' for the model. This very clean three tier mould is a most unusual example, the first we have seen, with eight hearts to the top, vertical finger forms beneath and a deep plinth rim. No dents, good internal tinning and ready for use if required. Polished and lacquered, although the lacquer may be removed at no extra cost and complete and in good and working order. 4.25" tall and 6.75" x 4.5". 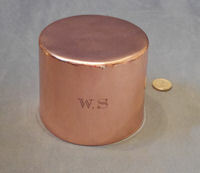 Original, quality 1920's 'Fez' shaped copper sponge mould with a tinned interior. Polished and lacquered, although the lacquer may be removed at no extra cost and complete and in good order. 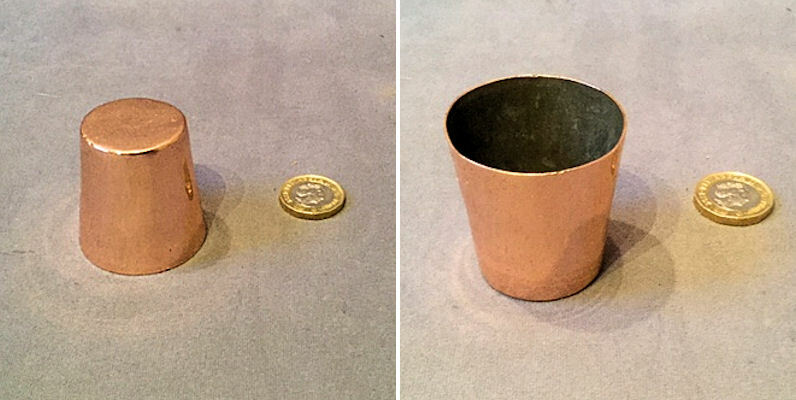 2.5" tall and 2.5" top diam. 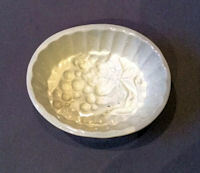 Original, quality late 19th century off white coloured ceramic small jelly mould with ribbed sides and the design in relief of a bunch of grapes to the inside. The underside is impressed for 'Copeland' the manufacturer. Not a chip in sight and complete and in good and working order. 3" x 3.75" and 1.75" tall. 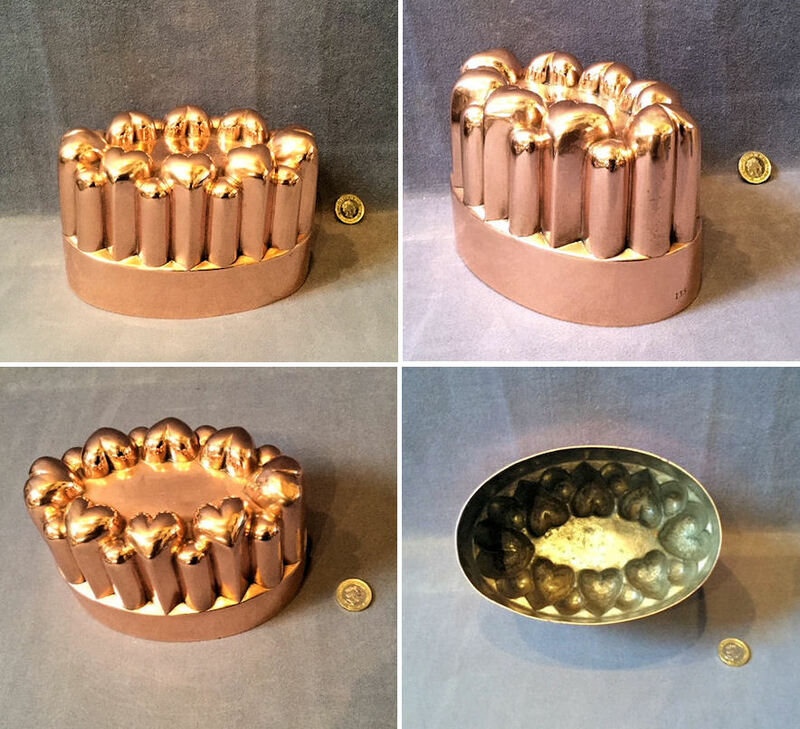 Original, quality 1920's small copper sponge mould of a plain form with good tinned interior. Polished and lacquered, although the lacquer may be removed at no extra cost and complete and in good and usable order. 2.25" tall and 2.5" widest. 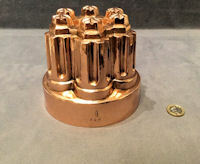 Original, quality 1920's small copper sponge mould of a plain design with good internal tinning. Polished and lacquered, although the lacquer may be removed at no extra cost and complete and in good and usable order. 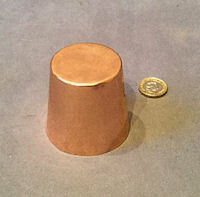 1.75" tall and 1.75" widest. Original, quality late 19th century small copper entree mould in the shape of a tongue, with a good tinned interior and a polished and lacquered exterior, although the lacquer may be removed at no extra cost. Complete and in good and working order. 3.75" x 1.5" wide and 1.25" tall. Price is for each. 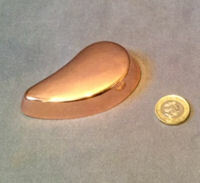 Original, quality 1920's copper entrée mould in a simple teardrop form. Unused and with perfect interior tinning to the underside. Polished and lacquered, although the lacquer may be removed at no extra cost and complete and in good and working order. 3.5" x 2" x 0.5". Price is for each. 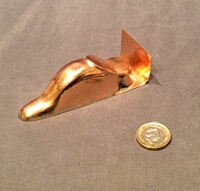 Original, quality late 19th century small copper entrée mould in the relief form of a teardrop shaped in good detail. This example has a good tinned interior, has been polished and lacquered, although the lacquer may be removed at no extra cost and is complete and in good and working order. 3" x 1.75" x 1". 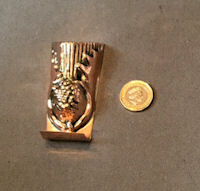 Original, quality late 19th century small copper entrée mould in the relief form of a thistle in good detail. This example has a good tinned interior, has been polished and lacquered, although the lacquer may be removed at no extra cost and is complete and in good and working order. 3" x 1.5" x 1". Price is for each. Original, quality late 19th century small copper entrée mould in the relief form of a log in good detail. This example has a good tinned interior, has been polished and lacquered, although the lacquer may be removed at no extra cost and is complete and in good and working order. 2.75" x 1.5" x 0.75". Price is for each. 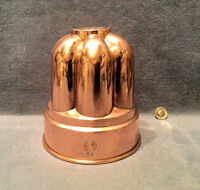 Original, quality 1920's larger continental copper sponge mould of a three tier form with a deep base plinth. The plinth is impressed for the manufacturer "Trottier Paris". The tinning to the interior is in excellent condition and all is complete and in superb condition with no dents or damage. Polished and lacquered, although the lacquer may be removed at no extra cost. 7" tall and 6.5" base diam. 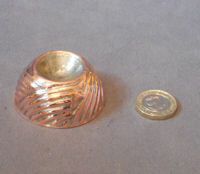 Original, quality late 19th century copper jelly mould of the ring form with a diagonal finger shaped pattern to the sides. This most unusual example is stamped with the model number '281'. An old small hole to the side has been repaired, this had been drilled to take a hanging ring, and the interior would need retinning if required for use, otherwise all is complete and in good and working order. Base diam 6.5" and 2" tall. 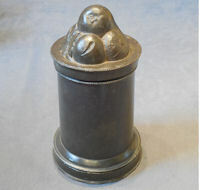 Original, quality late 19th century small copper entrée mould in the relief form of a nest in good detail. This example has a good tinned interior, has been polished and lacquered, although the lacquer may be removed at no extra cost and is complete and in good and working order. 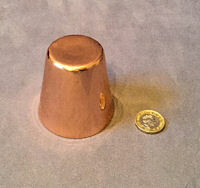 2" base diam x 0.75" tall. Price is for each. 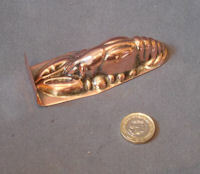 Original, quality late 19th century small copper entrée mould in the relief form of a lobster in good detail. This example has a good tinned interior, has been polished and lacquered, although the lacquer may be removed at no extra cost and is complete and in good and working order. 4" x 1.5" x 1". Price is for each. 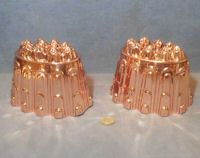 Original, quality pair of 1920's copper jelly moulds in unused condition. This superb pair of moulds each have tapered and seamed bodies with embossed decoration and the top sections have eight decorative shaped tips. Each mould is stamped 'HL and Co' for the manufacturer, possibly 'Henry Loveridge', and 'OL35C' and 287 for the model number. All has been polished and lacquered, although the lacquer may be removed at no extra cost and is complete and in good and working order. 4.75" tall and 6" x 4.5". 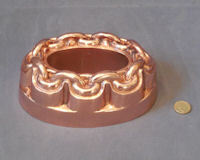 Original, quality late 19th century oval shaped copper jelly mould, with an central cavity. This example has a ring of chains design to the top on a two tiered body and the end of the plinth is stamped '631' for the model and the orb and cross logo for the manufacturer 'Benham and Froud' of London and Birmingham. Polished and lacquered, although the lacquer may be removed at no extra cost. The interior would need to be re tinned if wanted for use, otherwise complete and in good and working order. 7.5" x 5" and 2.75" tall. 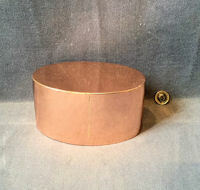 Original, quality, circular shaped, deep copper sponge mould, circa 1900, of a plain form with tapered sides. 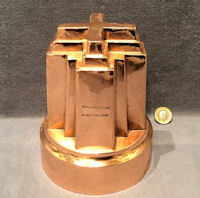 The tinning to the interior is in good order and the exterior is impressed "Jones Bros Down Street W." for the retailer / wholesaler and engraved "W.S." for the original owner. All has been polished and lacquered, although the lacquer may be removed at no extra cost. Complete and in good and working order. 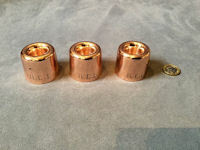 3.25" tall x 4.25" widest. 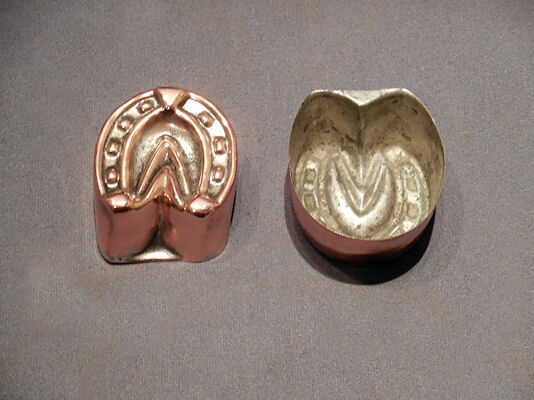 Original, quality, pressed copper, entrée mould, circa 1900, in the form of a horseshoe. The inside tinned surface is in good order and the exterior has been polished and lacquered, although the lacquer may be removed at no extra cost. All is complete and in good and working order. 2" x 1.75" x 1". Price is for each. Smaller examples may well be available reference code JM202. A good run of original, quality, pressed copper, small entrée moulds, circa 1900, in the form of a horseshoe. The inside tinned surface is in good order and the exterior has been polished and lacquered, although the lacquer may be removed at no extra cost. All is complete and in good and working order. 1.75" x 1.5" x 0.75". Price is for each. Larger examples may well be available reference code JM203. 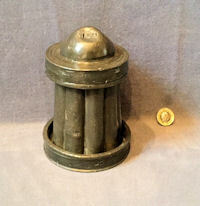 Original, quality, late 19th Century, tin jelly mould with a copper top section. Impressed to the tin body 'F95' and '2'. A good, clean mould with some old, minor repairs, but not ideal for use. Cleaned and lacquered and complete and in good order. 6" x 4.75" x 4.75" high. Original, quality, late 19th century, off white coloured, ceramic jelly mould, incised to the underside for the manufacturer "Copeland" with an internal pattern of the Prince of Wales feathers. All is complete and in good order. 5" x 4.5" x 3.75" tall. Original, quality, mid 19th century, cream coloured ceramic jelly mould in the form of a half melon and impressed to the underside 'Wedgwood'. Apart from some discolouration all is complete and in good order. 3.5" x 2.5" x 1.25". Another similar mould may be available, item code JM110. Original, quality, mid 19th century, cream coloured ceramic jelly mould in the form of a half melon and impressed to the underside 'Wedgwood'. Apart from some discolouration all is complete and in good order. 3.5" x 2.5" x 1.25". 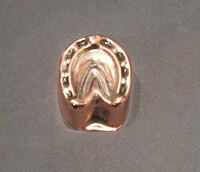 Another similar mould may be available, item code JM111. 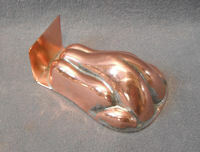 Original quality, 1920's, copper entrée mould of a simple teardrop form. This example appears unused, has perfect tinning to the inside and could still be used. 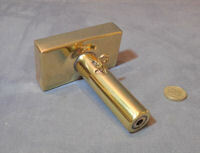 Has been polished and lacquered and is complete and in good and working order. The lacquer can be removed if required, at no extra cost. 3" x 1.75" x 0.5". Price is for each. 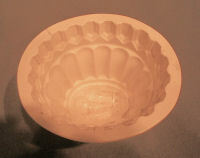 Original quality, 19th century, white ceramic jelly mould with a design of fruit in relief. Impressed to the underside of the foot for the maker "Copeland". Complete and in good and working order. 6.5" x 4.5" x 2.75" tall, foot 2.75" x 2". Original quality, late 19th century, small copper entrée mould in the relief form of a trussed chicken, with a good tinned interior. Has been polished and lacquered and is complete and in good and working order. The lacquer can be removed if required, at no extra cost. 2.75" x 2" x 1". Price is for each. Original quality, 19th century, white ceramic jelly mould in the form of a chicken. Impressed to the side with the manufacturer's stamp 'Copeland'. Complete and in superb order. 9.25" x 6.25" x 4.25" tall. Original, quality late 19th century three piece pewter ice mould for table food decoration. The top section is detailed with the impression of a peony flower head to the inside and is embossed "W.H for the manufacturer "Watts and Harton" and the middle section is ribbed to the inside. All has been waxed and is complete and in good and working order. 6.5" tall and 4 1/8" base diam. Original, quality late 19th century three piece pewter ice mould for table food decoration. The top section is detailed as the tips of a bunch of asparagus to the inside and is embossed "W.H for the manufacturer "Watts and Harton" and the middle section is ribbed to the inside as the stems of asparagus. All has been waxed and is complete and in good and working order. 6.5" tall and 4 1/8" base diam. Original, quality, late 19th century, three piece pewter ice mould for table food decorations. 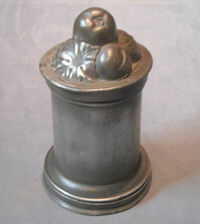 The top section is detailed with the impressions of a pile of fruit and the base is impressed "Quart", "3" and for the manufacturer "Biertumpfel and Son 138 Albany St London". The central body section is a ribbed tapered tube section and all is complete and in good and working order. 7" tall x 4" base diameter + 3.25" top collar. Original, quality, late 19th century, three piece pewter ice mould, for table food decoration. The top section is detailed with the impression of a pile of fresh fruit and the base is impressed "1 1/2 pint", "43" and has the orb and cross logo for the manufacturer 'Benham and Froud' of London and Birmingham. The central part is a ribbed tapered tube section and all is complete and in good order. 6" tall x 3.75" base diameter. Original, quality, late 19th century, three piece pewter ice mould for table food decorations. 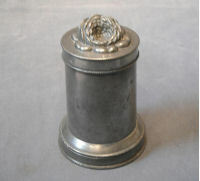 The top section is detailed with the impression of a peony head, middle section is ribbed to the inside and the base is impressed "Quart" for the size and with the registration lozenge mark for the year 1868. Some minor scuffs but in superb condition otherwise complete and in good working order. This model is one of the more detailed examples. 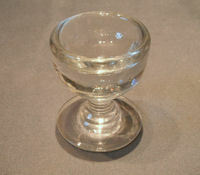 6.25" tall x 4.25" base diameter. Original, quality 1920's all brass ice cream dispenser for use with wafer biscuits. 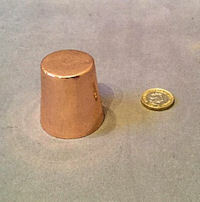 This good example is adjustable to deliver a halfpenny size and a penny size and will take wafers 3.5" x 1.75". All has been polished and lacquered, although the lacquer may be removed at no extra cost and is complete and in good and working order. 3.5" x 1.75" x 4.5". Original, quality 1920's, moulded glass 'penny lick' used to serve ice cream by street vendors during the late 19th and early 20th century. Complete and in good order. Base 2.25" diameter x 2.75" tall. Original, quality, late 19th century, galvanised on cast iron 'ice shave', used to shave ice for food preparation etc from blocks of ice. This example is embossed to the top "Gem Ice Shave, North Bros MFC. Co, Philadelphia" (USA). Cleaned, lacquered and complete and in good and working order. 6.25" x 2.25" x 2.25".